Why do the words jump off this page? Why does this writing feel energetic and strong? Why is it so fast-paced? And do you wonder why your draft text seems a tad limp in comparison? First drafts often require an injection of power and pizzazz. First drafts are full of weak verbs, and weak verbs make your writing limp, flabby, and listless. In contrast, strong verbs add action, vitality, color, and zest. So, the “secret” to writing with gusto is to choose stronger verbs. You feel the air reverberating when he slams his fist on the table. The teacups jiggle, his face reddens, and his voice thunders. Strong verbs allow readers to visualize actions. Instead of only reading words, they’re drawn into your writing, experiencing your story. He cradles the baby, strokes her dark hair, tickles her chin, and hums a lullaby. Strong verbs are precise and concrete. 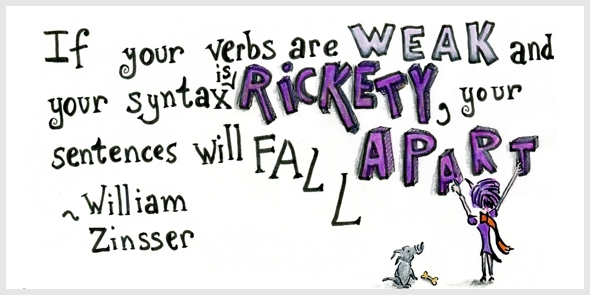 In contrast, weak verbs are abstract and generic—they don’t help you visualize a scene. Examples of weak verbs are “to be,” “to provide,” “to add,” and “to utilize.” You can’t picture these words. For instance, if someone provides feedback, is he shouting his comments? Or lecturing you with a smug face? Or perhaps scribbling a few suggestions in the margin of your handout? Over the weekend, I read Ray Bradbury’s “Zen in the Art of Writing.” I enjoyed his word choice, and I loved how his verbs breathe life into abstract concepts, like storytelling and the Muse. And the stories began to burst, to explode from those memories, hidden in the nouns, lost in the lists. The Muse, then, is the most terrified of all the virgins. She starts if she hears a sound, pales if you ask her questions, spins and vanishes if you disturb her dress. I tore out the pages, ate them with salt, doused them with relish, gnawed on the bindings, turned the chapters with my tongue! Bradbury’s choice of strong verbs (like “gnaw” and “douse”) adds zest and power. He uses few adjectives and adverbs to keep his writing fast-paced. You might think strong verbs are only for fiction writers. Throughout history, presenter-to-audience exchanges have rallied revolutions, spread innovation, and spawned movements. When a great story is told, we lean forward, and our hearts race as the story unfolds. Haven’t you often wished you could make customers, employees, investors, or students snap, crackle, pop, and move to the new place they need to be in order to create a new future? So whether you’re listening to music, watching videos, or making speakerphone calls, iPhone 7 lets you crank it up. Way, way up. Apple Watch Series 2 counts more than just steps. It tracks all the ways you move throughout the day, whether you’re walking between meetings, doing cartwheels with your kids, or hitting the gym. “To do” in the last sentence is, of course, a weak verb. Apple’s copywriters could have changed “doing cartwheels with your kids” into “cartwheeling with your kids” without disrupting the rhythm and making the sentence stronger. It is nouns and verbs, not their assistants, that give good writing its toughness and color. We don’t have to go to extremes and use verbs and nouns only. Adjectives and adverbs can add precision and nuance. In the half-light through the drawn curtains she sits on her perch, relaxed, hooded, extraordinary. Formidable talons, wicked, curved black beak, sleek, café-au-lait front streaked thickly with cocoa-coloured teardrops, looking for all the world like some cappuccino samurai. The craft of writing is more subtle than following the advice to write in verbs and nouns only. Adjectives and adverbs may allow readers to sit back and admire a scene instead of racing through your words. You’re the writer—you can play with your words, then choose which words express your voice and your thoughts best. No clear distinction exists between strong and weak verbs. It’s a gliding scale, and it’s up to you as a writer to decide how strong you’d like your verbs to be. Strong verbs are more precise than weak verbs; they can paint clear pictures—even of abstract activities like thinking and generating ideas. Imagine this: how would readers experience your voice if you used fewer adjectives and adverbs? While quietly sitting at her wooden desk, she slowly formulated her thoughts and worked really hard to write her blog post. The next day she felt apprehensive and nervously hit publish. Would her audience be interested enough to read her content word-by-word? For hours, she sat at her desk. She wracked her brain, and slaved over her words to produce a blog post. And the next day? She hit publish with trepidation. Would her audience gobble up her words? The thesaurus is your friend. Use a thesaurus to find more precise alternatives for weak verbs. Finding your voice is about experimentation. Try writing with verbs and nouns only. Then stuff your writing with adjectives and adverbs. Read both versions aloud as if you’ve never seen them before. What works? What doesn’t work? Which words do you like? Play with your words. Have fun. And discover your voice. Wow, great post! And now my task begins, to translate your list of strong verbs into Dutch 🙂 Somehow I have always thought of English as the more powerful language. But I will hunt those strong Dutch verbs down, so I can make my copy sparkle like yours. And when you read another interesting verb (in newspapers, blog posts, or fiction), you can add to your list. Happy writing, Cindy. And thank you for stopping by. You are such a wonderful writer! Oh man, this is such a pain point for me as a non-native speaker! 😀 The only way to think beyond “said”, “did”, “was” is to read, and read a lot. Happy writing, Gill. Thank you for stopping by! Wow, what a great resource. For a non native English speaker like me, this is very useful. I will try to use more of this verbs in my writing but also while speaking. Good vocabulary (and verbs) determine the way people see us, better be good and strong! Oh, wow, I’m honored to be included in your article. I’m going to check out the other presentations. You made me curious! Thank you, Peter. Happy power writing! I Appreciate all the work I know this post took. Excellent job and fun to read. Love Zinsser! When I met his steely gaze and did not cry, he slapped me hard, filling the air with his body odor. An editor once shared with me that she knew I had contributed an anonymous piece for her friend’s magazine, because my style was noticeable, to her. Yes, that’s such a good point, and a wonderful example! I love how you contrast strong action words with the simple “I sat.” The contrast is further stressed because you have a long sentence, then a super-short one. I love it! I’m not surprised that your writing stands out and your voice is recognized. Thank you for sharing this, Katharine. Thank you so much. This is just what I need, and it has come at the right time too for me. I’m happy to read that. 🙂 Thank you for stopping by, Helen. Happy writing! How totally fun! And wonderful example of transforming a sentence. Something clicked when you said your word choice shapes your voice. Great post! Thanks for this list of strong verbs. I will surely use them in the next copy I use. Can we use them on our sales page copy or will it be too loud to use them? Yes, sure, you can also use them in sales copy, just use them in a small dosage. Don’t overdo it. Wowza. This one boggled, blew away and some other cool verb that starts with B. I’m writing a piece about power writing and power verbs is a section. I’ll have to refer to this great post. Great post. Thanks Henneke. This is one of the points I’m slaving over, along with telling better stories. I’ve declared war on adverbs. I use the Hemingway app. It helps obliterate adverbs. But now my sights are set on strong verbs. A little more tricky than adverbs, but practice makes perfect. It may feel more tricky, but I’d say it’s also more fun. Try turning it in a game … for instance, how many different verbs can you try in the key sentence of your article? Happy writing, Jansie. And thank you for stopping by to leave a comment. That’s exactly how I try to approach it. But it’s tiring. If you write long articles like I do, keeping it all together becomes a difficult task. I draw blanks. Definitely take breaks. More than one. Write, edit, write, edit, edit, edit. Month later, check back again. Read on laptop; read on mobile. I’ve long dropped the notion of writing being “art”; that futile fable that, once your article is posted, you’re not allowed to edit it. Suppose only sticking to it relentlessly will make it come easier. So that’s where I’m at. Your post happened at the right time. Awesome as always Henneke. I’ll be saving this article to refer back to. What a great way to introduce the concept of strong verbs without it sounding like a boring lecture. I must have read about this concept 100 times before, but never in a way that was this fun to read! What a lovely compliment, Amy. Thank you. Happy writing! Hey this is great stuff, Henneke! The only comment I would make is that I think Apple has it right when they say “doing cartwheels.” For the general public, the expression is to “do a cartwheel” and not “to cartwheel.” Although this verb exists, it’s a different level of language. But I think that it still proves your point, because even if “doing” seems weak ,”doing cartwheels” is very concrete and evocative for the audience, so that’s the most important thing. Just to say, sometimes style is subjective, even when it comes to verbs! Great post! Thank you for adding your thoughts. I appreciate your comment! This is an excellent post! My writing has been particularly drab. Now, I know why. I am certain that choosing the right verbs as you’ve suggested would add the zest that is sorely needed. Your site is such an invaluable tool and I so appreciate what you do! What a lovely comment. Thank you, Patricia. You put a smile on my face. I’m sure your content isn’t as drab as you think. Happy writing! Another eye opener for me, Henneke. Thank you for your skill in teaching the power of grammar in a shockingly simple way! I love writing posts like this 🙂 Thank you for your lovely compliment, Fiona. I appreciate it! Awesome! I am bookmarking this post. I will read it again and again and again, to keep reminding myself how to give my writing energy with strong verbs. Henneke thank you for another thought-provoking piece! Your posts challenge me to dig deep. After devouring this, I want to race to my keyboard and tap away until my words sparkle and shine. At the end of a writing day I am usually too tired to think of good headlines. Not smart, I know. You do such a great job there. Very wise. And very patient. Amazing help as usual ….thank you Henneke 🙂 great post. Thank you, Maria. Happy writing! This is huge! Thank you so much for sharing this, Henneke! I’ve read every single word this information goldmine and it was tremendously helpful. If you don’t mind, please tell me whether in the sentence, “most of us would rather clean the bathroom than do push-ups,” we should replace the verb “to do.” If the answer is yes, then what’s the alternative? I’d keep “do push-ups.” That’s how people say it. You don’t always need stronger verbs. If every verb in every sentence is strong, then it’s overkill and that’s tiring for your reader. It’s about balance and stressing what’s important. Great stuff. I’ve already used it in a couple of business marketing collaterals. This post woke me up today. LOVE it. I actually strip strong, simple words from my readings, capturing them on word and idea lists to spice up my writings. Everybody who is intent on persuading needs to gobble up strong words. Thank you for your lovely comment, Kathleen. I appreciate it! What a lovely comment, Lisa. I’m so glad this post gives you hope. I try turning writing into a game and have some fun with my words. Is there anything specific that you hate about writing? Thanks for inspiring us with these fine examples of strong verbs. As you said, it’s easy to think these are more suited to fiction writing. But the example from Apple shows how you can add some oomph to business writing too. Thank you for stopping by, David. Happy power writing! Wonderful! I’m working on a rough draft now of a blog post and know your suggestions will kick it up a notch. I love how you explained “strong verbs” and how to use them to add life to our writing. Thank you for all you do! Great! I’m glad you find this helpful. A crackling post which made me jump around in glee like a boy who found his favorite candy. Rocketed out of my chair and made a dash for my word-weary thesaurus. Thank you for your comment, Santosh. Happy power writing! How was that? I love your words. Thank you for your lovely comment, Sam. Playing with your words is key, I think. Everytime I read something, especially of yours, certain words DO leap off the screen to me. And I find myself severely disappointed when I read something and it’s just dull and boring. I literally roll my eyes and rush through it hoping there’s at least some valuable gems I could pull from the copy. Long story short, you hit the nail on the head. I absolutely love “to galvanize” and “to scour”. You’re very persistent if you persevere in reading boring content! I’m very impatient as a reader. I rarely read on if I don’t like an opening paragraph. Isn’t it interesting how we all have our favorite words? This is the third of your many articles I have read in the last hour. Thank you for all this free information. I’m want to be a better writer. Oooh, I feel all zingy and raring to go. I’d noticed my copy was becoming boringly, samey and coma inducing to the point I was on autopilot with what I was writing. I’m going to print off your list of fab verbs and play with my writing. Be sure to add a few of your own favorites to the list, too. It’s a fun exercise. Thanks Henneke for your insight in making sentences come alive. I like your procedure for stripping out flab from the draft text and then enlivening it with action. All the best from sunny Sydney. Good work. I see you as a motivational football coach. You inspired me. Many thanks. It might have been a good idea to first check if the terms ‘strong verb’ and ‘weak verb’ were already in use and well defined. They are, and they do not mean anything like this. Strong verbs modify an internal vowel sound to form the preterite, while weak verbs use the suffix ‘-ed’ or ‘-d’ to form the preterite. Hi Nicholas – I’m aware of the grammatical interpretation of strong vs weak verbs. In this article, I have followed the meaning of strong verbs like William Zinsser uses in his book “On Writing Well.” For example, this is a quote from his book: “Again and again in careless writing, strong verbs are weakened by redundant adverbs.” (page 68 in the 30th anniversary edition) It’s similar to the quote on weak verbs I use in the picture at the top of this page. What is not clear to me is the way experienced writers appear to see a sentence broken down into grammar. adjective, subject, verb, adverb, and object (if present). I find it difficult to analyse a sentence in this way before I put the idea into text since it was 50 years ago when I had my last English class. While I understand the fundamentals of your writing tips, I can’t imagine writing a manuscript with creative passion using only strong nouns and verbs and then adding adjectives and adverbs later. Surely, this must be an acquired skill?